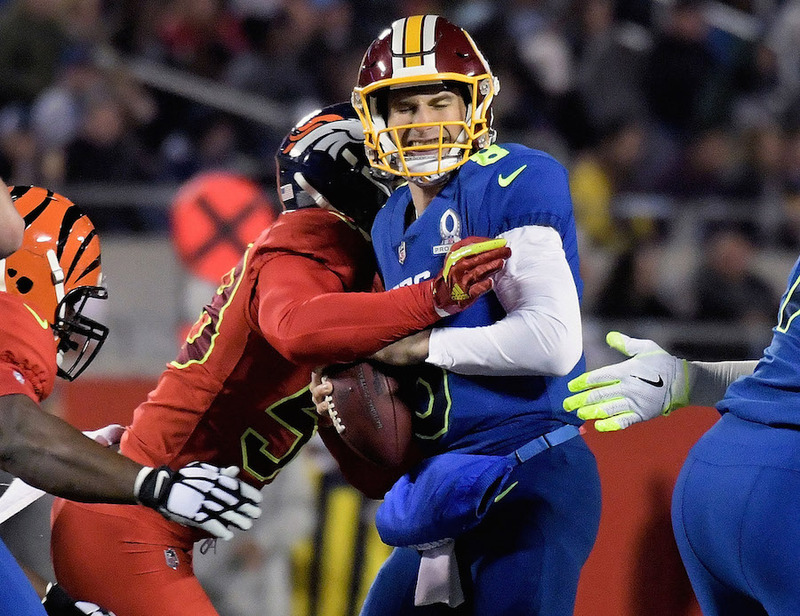 The Denver Broncos have All-Pro linebacker Von Miller leading the “Kirk Cousins-to-Denver” hype train. The Cleveland Browns have All-Pro left tackle Joe Thomas doing the same. Everyone in the football world has an opinion, and Thomas has grown more vocal since this post about Cleveland being the right fit for Cousins. The implication is that Cousins could cement (or is it bronze?) himself in Cleveland Browns history if he could deliver the team from it’s lowest lows (0-16 record in 2017, 1-15 in 2016) back to Super Bowl contention. Thomas continued to lobby, reminding Cousins that the Browns have more cap space than any team in the league right now, and suggesting that Cleveland presents “by FAR” the best opportunity to turn a categorically awful franchise into a winning one. “Don’t just go and be another quarterback somewhere else!” Thomas concluded. The 11-year veteran has a point, to a degree. The bar isn’t set particularly high in terms of legendary Browns quarterbacks (at least in the modern era). Cousins would essentially have to surpass Brian Sipe and Bernie Kosar to be considered the greatest modern Browns QB. Delivering a Super Bowl win to the hard-luck Browns would even probably be enough to supplant Otto Graham (1946-55) as the top QB in franchise history. Graham led the Browns to three NFL Championships, however Cleveland has never appeared in the Super Bowl since the AFL-NFL merger. Cousins would have a much steeper hill to climb in terms of franchise glory if he were to sign with the Broncos. Denver already has three quarterbacks whose numbers are retired — John Elway’s No. 7 and Frank Tripuka and Peyton Manning’s No. 18. Elway (two) and Manning (one) each have won Super Bowls in Broncos uniforms, setting a very high standard at the position. With that said, Denver is just two years removed from winning a Super Bowl and has a long tradition of playoff success (sometimes at the Browns’ expense). Sure, Cousins might get more individual credit in Cleveland for delivering postseason success — but given the Browns’ 10 consecutive losing seasons and total of four wins over the past three seasons, is that all just wishful thinking on Thomas’ part? Teams can begin negotiations and agree to terms with free agents on March 12. Teams can officially sign free agents as of 2 p.m. MT on March 14. We’ll find out then which situation (including others courting Cousins) the top free agent of the 2018 class believes is best for him.